A screenshot showing the Atlas in use. For more than 30 years the LRC has been engaged in archaeological research in the Vale of Pickering. Huge excavations and a very long programme of air-photography and geophysical survey have transformed our understanding of the scale, density and distribution of archaeology of all periods in one part of the Vale. Geophysical surveys concentrated on the southern side of the Vale, in the areas to the east and west of West Heslerton, combine to form the largest such survey in the world. Comparative surveys and air photographic survey elsewhere in the Vale, particularly in the areas of sand and gravel sub-soils that were perfectly suited to prehistoric and later settlement, indicates that the remarkable discoveries made in the Heslerton area are representative of activity elsewhere in the Vale of Pickering and probably the sand and gravel margins that follow the edges of most river valleys in lowland England. The publication of the results of such research is a significant challenge in that we need to be able to see the results at any scale in a format that encapsulates the passage of time and permits interactive enquiry. Vast paper printouts up to 5 metres long showing the combined geophysical surveys have been presented to great effect at archaeological conferences and in museum displays but are ill suited to conventional publication. 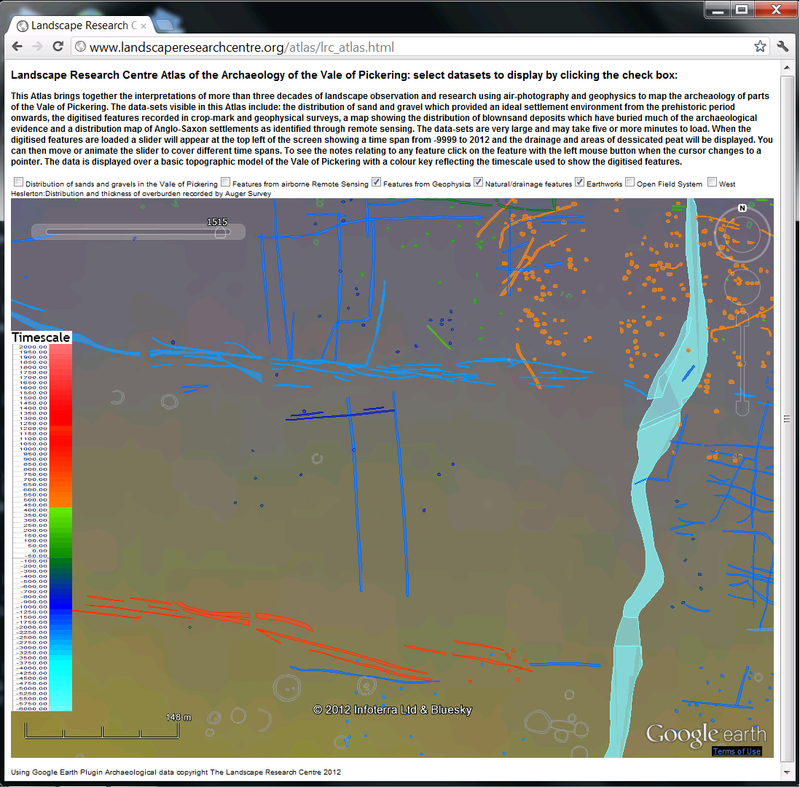 The LRC Digital Atlas of the Archaeology of the Vale of Pickering is presented using the Google Earth plugin to display the interpreted results of decades of study draped upon a coloured 3D model of the Vale. It allows one to view and interrogate data at a landscape scale without the clutter of modern features normally visible in Google Earth. A key problem in any atlas devoted to archaeological evidence is the need to include the fourth dimension, time, in a way that is more dynamic than simply producing maps related to any particular static date. To enhance the usefulness of the Atlas, for looking at landscape change over time, each individually mapped feature is given three chronological attributes: a start date, an end date and a continuity date. These three dates, for the most part based on simple interpretations according to feature form and class, represent estimates of the date when a feature was created, the point at which it goes out of active use and the point after which it is unlikely to form an identifiable component in the landscape. An example might be a Late Neolithic burial mound or barrow which may have been built at c2500BC, continued in active use as a mortuary structure until c1800BC and then survived as an upstanding monument influencing the landscape until the 18th century when it is effectively removed as new field systems are formed. These date fields have been used to code each feature so that they can be viewed using the clock slider bar, which controls the display of time related data in Google Earth. The colour of the feature is determined by the estimated start date, if a continuity date is assigned the colour will change after the end of use date and the feature coloured grey until a point when its influence of the landscape is effectively lost. The Time Slider Bar in Google Earth allows you to display features at any particular date, or reflecting date span over time. In addition to using the slider bar to reveal the pattern of features at any particular time it can also be used to animate change over time. The speed of time based animation cannot currently be reduced to an ideal level. The Atlas does not attempt to reveal all the archaeology of the Vale of Pickering, but the results of more than 30 years work by the LRC; as a result the area along the south eastern part of the Vale between the modern villages of Rillington and Potter Brompton has the most comprehensive data-set. Surveys elsewhere in the Vale suggest that those areas studied intensively are representative of the levels of activity throughout the Vale of Pickering. The creation of the Atlas and in particular the massive data collection and data interpretation exercise owes a tremendous amount to the work of James Lyall, who has managed or carried out the majority of the 1250Ha of geophysical surveys undertaken by the LRC, digitised the thousands of features identified and classified the features according to their form, class and date range. We fully appreciate that some features may be miss-represented or given inappropriate date points; this is in the nature of remote sensing and the data set is maintained in a GIS database which is designed to absorb new interpretations and date information as new evidence comes to light. The Atlas is based upon very large data-sets and may not run successfully on older computers running Windows XP or those having less than 4Gb of RAM. The performance is determined by the speed of internet connection and performance of the local computer. The performance can be sluggish even on relatively well specified computers, particularly when viewing a large area, but once zoomed in the density and complexity of the remarkable hidden landscape is exposed. The underlying coloured digital elevation model shows the Vale of Pickering bounded on the south by the Yorkshire Wolds and the Howardian Hills and the North York Moors to the north. Data layers reflecting the distribution of sand and gravel soils, a preferred environment for settlement during the later prehistoric to medieval periods, features identified through airborne remote sensing, geomagnetic survey, natural features, particularly relating to drainage and areas of desiccated peat, upstanding earthwork monuments recorded in early maps and the open field systems that rewrote the shape of the landscape, perhaps as early as the ninth century. The airborne remote sensing data-set is not comprehensive and primarily includes data which compliments the evidence from ground based geophysics. An additional data layer shows the results of an intensive auger survey which shows the degree of protection given to the features buried beneath featureless flat fields by a layer of blown sand that gives the archaeology of this landscape a particular importance. The Atlas delivers many megabytes of data please be patient, it can for instance take up to 5 minutes to load the ground based geophysical survey results. The Atlas has been updated to include an additional layer, rough sketch plots of crop-marks throughout the Vale derived from map overlays held by the NYCC Historic Environment Team. These plots, generated as vector plans from the scanned map overlays, give a basic picture of the extent of the crop-mark record throughout the Vale, they are not all-inclusive or necessarily up-to-date, and are not time coded or presented with any underlying interpretation. Despite these limitations the inclusion of this data layer gives a clear picture of those areas which are sensitive to crop-mark formation, and the scale of known activity beyond the core LRC research area. Within the core area the difference between the sketch plot evidence and that resulting from the long term remote sensing programme reflects more than a tenfold increase in identified activity. The evidence indicates that the complexity and level of activity identified in the area centered around West Heslerton is not unique but a reflection of the levels of past populations and activity throughout much of the Vale of Pickering. As such, it challenges established views of population density, land-use and continuity and also approaches to securing a sustainable strategy for managing the irreplaceable buried evidence of past peoples and societies, in the face of mineral extraction and increasingly industrialised farming. To open the Atlas follow the link here, if you do not have the Google Earth Plugin this should install automatically. Please Note this address has changed following a move to a Linux server.